Kabaddi is a lively game ~ much loved in Tamil Nadu – as in many parts of the Nation. The 6thSeason of Pro-kabaddi got off to a great start as Tamil Thalaivas displayed aggressive kabaddi in the opening game to take out defending champions Patna Pirates 42-26 at the Jawaharlal Nehru Indoor Stadium in Chennai. Captain Ajay Thakur scored an impressive 14 points to lead Tamil thalaivas to their first victory at home while Amit Hooda kept opposition captain Pardeep Narwal from running away with the game and scored 4 tackle points in the process. 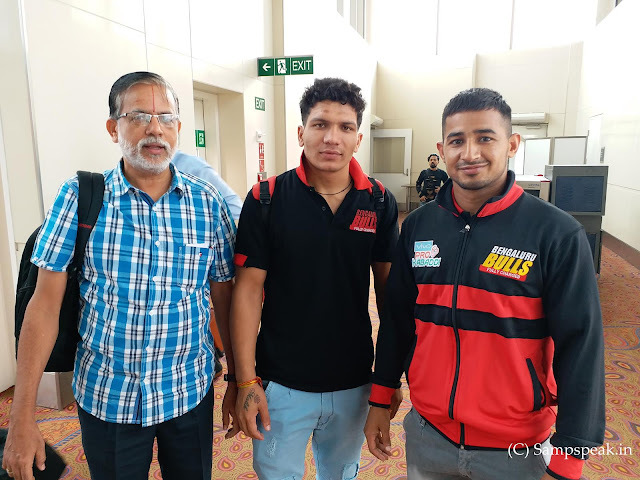 I had the pleasure of travelling with Bengaluru Bulls Team on a flight to Mumbai and today was looking forward to the star raider Kashiling Adake’s exploits. The matches are unpredictable and today Bengaluru Bulls won the toss & selected the Choice of court. Thalaiva’s star Ajay Thakur had an unsuccessful raid on the first minute .. .. Bengaluru dominated right from the star, and its star performer was its raider Pawankumar Sehrawat .. the man, for whom I was waiting at last got a chance to raid in 10th minute and it was only an empty raid – in between Manjeet Chillar went for an illogical review and surrendered the technological advantage. Finally Bulls completed 48-37 win over Thalaivas, who have disappointed in 3 games after their first match win. Frog jump : One of the most visually spectacular feats in kabaddi where the raider launches himself off the ground, touches one of more defenders whilst air-borne and lands beyond their reach, before escaping to safety. Super Tackle : is when a raider is stopped by a defending team with 3 players or less, meaning less than half the defence. And because this makes the tackle more difficult, the defending team gets TWO points for it. But the additional point cannot bring back previously eliminated players. Super Raid : is when a raider returns to his half after contacting 3 or more defenders, getting his team one point for each defender. If the raider taps 2 or more defenders AND scores a Bonus Point, it is ALSO counted as a Super Raid. In the present edition of Pro Kabaddi – there are 12 teams. 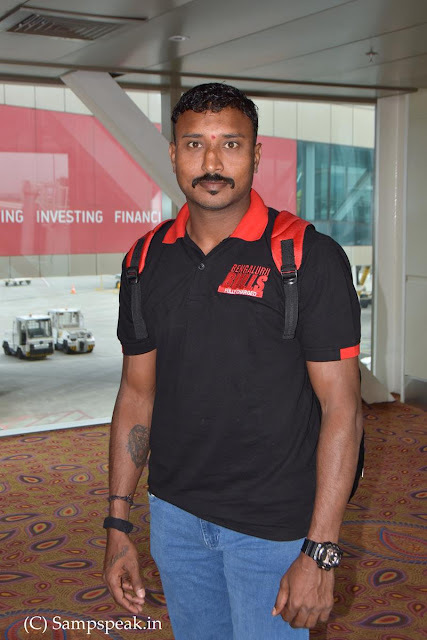 In Zone A are : Dabang Delhi K.C. ; Gujarat Fortunegiants; Haryana Steelers; Jaipur Pink Panthers; Puneri Paltan & U Mumba. In Zone B -: Bengal Warriors; Bengaluru Bulls; Patna Pirates; Tamil Thalaivas; Telugu Titans & U.P. Yoddha. In the first match of the day, U Mumba rallied late into the day to seal a thrilling 39-32 win over Jaipur Pink Panthers at the Jawaharlal Nehru Indoor Stadium in Chennai today. Jaipur got off to a quick start with Left Corner Sandeep Dhull leading the way for Jaipur Pink Panthers in defence with three tackles points in the first half. U Mumba’s raiders found it hard to get anything off the Jaipur chain in the early exchanges as the Panthers’ lead kept creeping up. Jaipur’s early pressure finally paid off with Dhull’s tackle on Siddharth Desai enforcing the first All-Out of the game on U Mumba. But once they got back on the mat, U Mumba’s defence came back with a purpose. They offered almost nothing to the Jaipur Pink Panthers raiders with captain Fazel Atrachali leading the way for his side with brilliant holds on Anup Kumar and Deepak Hooda to cut Jaipur’s lead to just two. Tamil Thalaivas won a number of hearts when they made their Pro Kabaddi debut in Season 5 for their fighting spirit and never-say-die attitude. The man who was instrumental in the rallying the entire team behind this ideology was the team’s skipper and primary raider, Ajay Thakur. Now with continued losses, the team appears to be struggling.